Three-year-old Estella became somewhat of an internet sensation after she cheekily stole the Popes hat right of his head. Three-year-old Estella has become somewhat of an internet sensation after she cheekily stole the pope's hat right of his head. 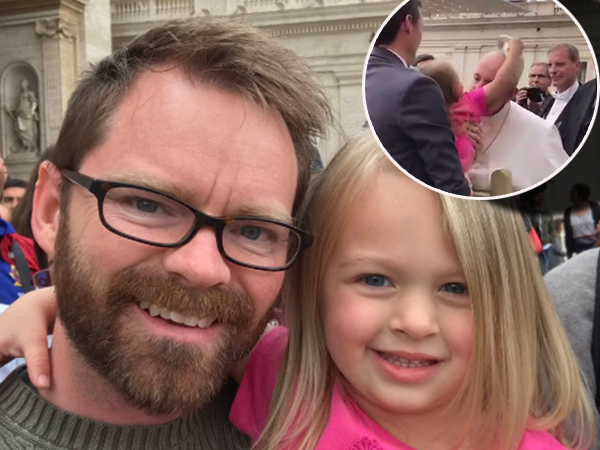 The cute tot — from Georgia in the US — was in St. Peter’s Square in the Vatican City, Rome, with her family and godfather, Mountain Butorac, who organises and leads Catholic pilgrimages. The pair had been waiting to meet Pope Francis for about three hours when Estella started getting restless. Butorac told Buzzfeed News that one of the pope's entourage at this point invited Estella over to meet him. “She was excited,” Butorac says. In a video taken by one of the other family members, the pope is seen greeting the young girl with a kiss on the cheek and as he pulls away she deftly reaches over his head and picks his zucchetto (scull cap) right off his head. Butorac shared the video on Twitter, where it has since received over 16 000 retweets, 38 000 likes — and counting.